Any Crimson Tide fan who didn’t hear the words “not again” rattling around their worried brains during Everett’s game vs. Lowell on March 6 either knows nothing of the program’s recent history or is uncommonly optimistic. Isaiah Likely powers his way to the basket during Saturday’s North Final at the Tsongas Center. 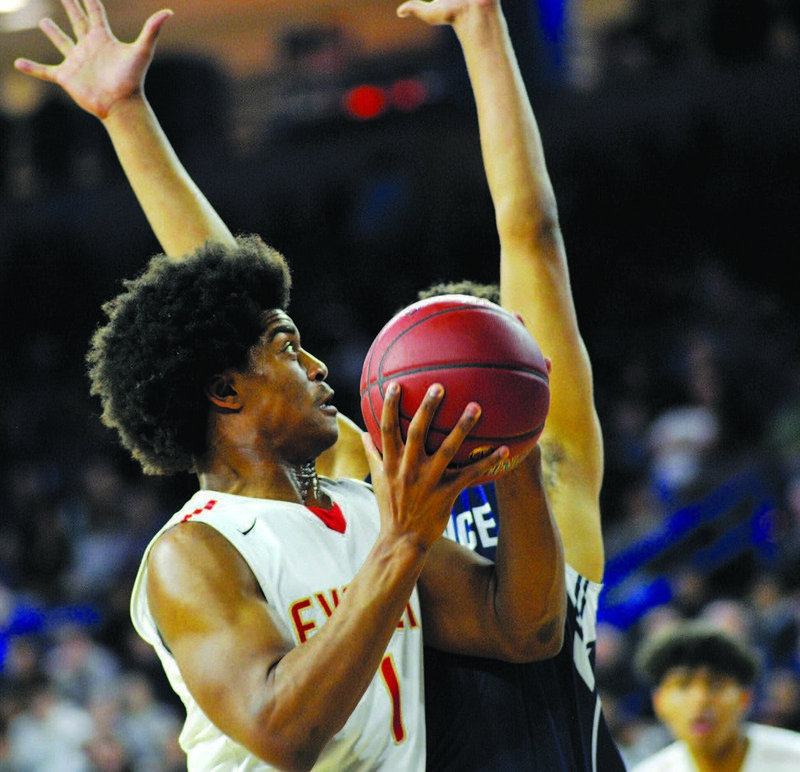 Everett High School was making its sixth consecutive appearance in the Div. 1 North semifinals, having failed in its five previous attempts, an excruciating streak that highlights the unfair nature of competitive sports. On the one hand, you have to be a good team to reach the sectional semifinals in a given season, and you have to be an excellent program to do it regularly; on the flip side, no one remembers sectional semifinalists. It was no surprise, then, that relief, not jubilation, characterized the mood inside Everett’s lockerroom after the Tide clambered over the semifinal roadblock at the expense of an unrelenting Lowell team, 71-68. It was a nerve-wracking night. EHS led 18-11 after one quarter and 50-43 after three, but Lowell loudly announced its presence every time it looked like they were ready to quietly retreat to the Merrimack Valley. This was due mostly to Alex Rivera, a senior guard who scored 35 points, 20 in the fourth quarter, and who at times appeared ready to single-handedly drag his team into the Sectional Final. He made seven 3-pointers, all of which were fiercely defended by a player in Crimson. And he sank at least that many of his 3-pointers from well behind the arc. You can’t be too complimentary of his effort — the kid flashed more range than a Boeing 747. Equal credit goes to Everett for grinding it out over the final minute of the contest. It wasn’t flawless, or even very smooth, but it was hard-nosed and hard-earned. The effort squarely passes the time-tested, three-word tournament litmus test: Survive and advance. Let’s pick up the action midway through the fourth quarter, when a 3-pointer by Ghared Boyce gave EHS a 60-54 lead and an oh-so brief glimmer of hope that defibrillators wouldn’t be needed on the Everett side of the Salem High Gymnasium. Rivera scored six straight points, tying the game at 60. Everett regained a pair of 4-point leads, at 64-60 and 66-62, but another trifecta by Rivera made it 67-65 with 35 seconds to go. A subsequent EHS turnover gave Lowell a chance to tie or take the lead, but a 3-point try by Nate Siow was off the mark, and Everett’s Erick Thompson was fouled after pulling down a physical rebound in traffic. Thompson made both free-throw shots, giving EHS a 69-65 advantage with 23.9 second showing on the clock. The brief remainder of the game was ragged. After Rivera sank two free throws, the teams traded turnovers, the second of which forced Rivera to commit his fifth foul of the night with 16.7 seconds to go. Single free throws by Thompson and Isaiah Likely gave Everett a 71-68 lead with 6.4 seconds to go. Without Rivera on the court, Lowell’s final possession was a dud; the Red Raiders quickly turned the ball over, never coming close to setting up a potential game-tying shot, let alone attempting one. Whereas Lowell revolved around Rivera, Everett was bolstered by several really good performances. Likely chalked up a double-double with 13 points and 14 rebounds, and had the best all-around performance of the night. Boyce shook off a tough first half to finish with a team-high 21 points, including 9 in the third quarter when EHS turned a one-point halftime deficit (33-32) into a 50-43 lead. Smooth-shooting southpaw Caleb Jacobs scored 17 points, six in the first quarter when EHS raced out to leads of 14-6, 16-8, and 18-11. Thompson dropped in 14 points, including a short jump shot that gave Everett the lead for good, 62-60, late in the fourth quarter.